You are currently browsing the Suburban Homesteading – Frugal Living blog archives for June, 2015. 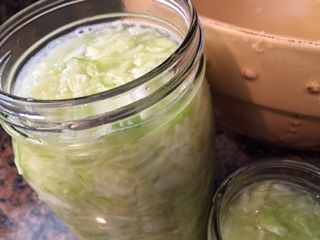 For years I have been toying with the idea of learning how to ferment vegetables; sauerkraut in particular. It’s a condiment I’ve always loved—that crisp, tangy flavor brightens any number of dishes. I loved the versions I found in German markets or restaurants over the insipid, limp store bought kind. But, in reality I was intimidated by the process of foaming, fermenting veggies under my kitchen sink. I, mistakenly, thought the process was hard and time consuming, like some kind of grandiose chemistry experiment. Time was something a mom with a farm and a kid has little of and I dreaded getting half way through the process and pulled away by, well, life. But, boy was I wrong! Very wrong. 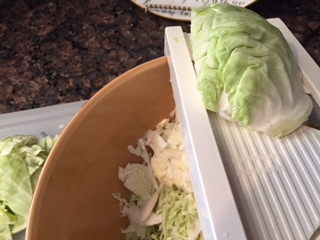 Nothing could be easier or simpler than slicing cabbage, sprinkling it with salt and mushing it around with your hands until those wonderful fermenting juices start to flow. After that the process pretty much handles itself. I got my courage up when my favorite little market had cabbages on sale, 4 for $1.00. What did I have to lose, I thought, if I screwed it up. I could afford to waste a quarter if it all went to hell. Besides, the chickens or compost pile would be the happy recipients of any disastrous efforts anyway. So I dug through the display to find the smallest cabbage they had. We are, after all, a 2 person household and I knew I didn’t want a mound of kraut even if everything did turn out fine. The recipe below is for one head of cabbage, but if you’d like to make more just double the recipe. It doesn’t take any more time to make a big batch versus a small one. Remove any damaged or wilted leaves and wash in cold water. 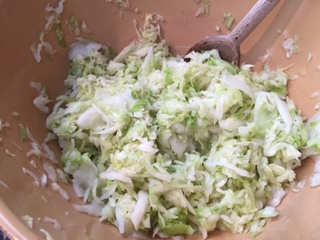 Cut cabbage into quarters and remove the core. 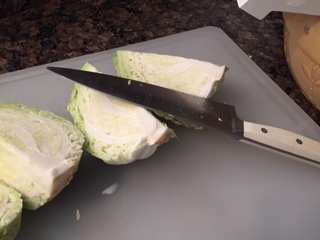 Cut cabbage with a knife into 1/4 inch slices. Or, use a Mandoline like I did to make the slices even and the job faster. Either way is fine. It doesn’t have to be perfect. Place cabbage in a bowl large enough for you to work in. Sprinkle 1-1/2 Tbsp sea salt over the top. Let this stand for about 15-minutes or so to let the juices start flowing, then you can begin mushing. I used my hands because it was easier to mix it up well and dig down to the bottom of the bowl, but you can use whatever you like–wooden spoon, wooden fork or anything that is blunt. The goal here is to mush the cabbage to release the juices. I mushed and kneaded for about 10-minutes and that gave me a nice pool of juice at the bottom of the bowl. That’s what you want. Now you can start packing your jar. I used a wide-mouth quart size canning jar. 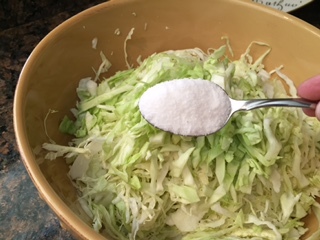 Place one or two handfuls of cabbage in the bottom of the jar and tamp it down with a wooden spoon. The goal here is to get rid of any air bubbles. BRINE — dissolve 1 Tbsp of sea salt in 4-cups of water, but not tap water. It creates a reaction and will spoil your kraut. If you have extra brine, put it in a jar and store in the fridge. It lasts forever. Pour the brine over the cabbage, but leave about an inch of head space. 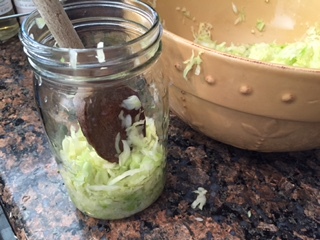 If the cabbage floats at the top use the cores, wedged under the lip of the jar to hold it down. Any cabbage exposed to the air will need to be thrown out. My batch made one quart and one pint jar, so it’s always a good idea to have an extra jar handy. Place the lid and band on the jar and screw down finger tight only. Place jar in a cool dark place at room-temperature for about a week. After a few days you can loosen the lid so the jar can “burp”, releasing any gasses, then tighten it again. It’s also a good idea to put the jar on a plate or shallow dish in case it leaks, which they can do from time to time. Now all you have to do is wait for nature to take its course, which will take about a week or so. Once you’re sauerkraut is ready it can be stored in the fridge. The great thing about fermented veggies is they keep for a long time when properly stored. The other great thing about sauerkraut is its health benefits. It’s a wonderful probiotic and digestive aid. Wonder what the ancient Germans knew that we have forgotten? Keep in mind, though, that to reap its health rewards the sauerkraut must be raw. Canning, cooking or heating kraut diminishes its health benefits because heat destroys the good bacteria and enzymes. There you have it…quick, easy and full of nutritious benefits. My sauerkraut experiment wasn’t a science experiment at all, but a wonderfully successful 20 minute project. After this, why use store-bought kraut again? A Few Notes for Success. Use only wooden utensils and a glass or ceramic bowl. Metal causes a reaction with the brine. If you prefer a little flavor to you sauerkraut try a bit of celery seeds, caraway seed or juniper berries. When the sauerkraut is exposed to air it may turn brown or develop a scum on the top. Just spoon that off and you’re good to go. Sauerkraut is a lacto-fermented food full of good bacteria to keep it, and you, safe. However, if at any time your batch smells funny, rancid or has a sharp flavor toss it. Better safe than sorry. Not all salts are made equal, and sea salt works much better for fermenting that iodized salt does. Ever since I can remember my one dream (or fantasy) has been to have a large orchard of my favorite fruits; chalk full of crisp juicy apples, sweet plums, pears, pluots, and peaches. I can see in my mind’s eye tall grasses and colorful wildflowers growing in between the trees, and let’s not forget the heady scent of blossoms floating on a light spring breeze. This is surely my kind of decadent. But, on a small suburban homestead where space is at a premium and a large variety of trees is not practical, how do you make the dream a reality? Add to that the fact that most fruit trees take time to produce…sometimes several years, and the mind reels. How do you go from dream to reality? My answer…step-by-step, that’s how. STEP 1: Start with a Plan. As with most projects on my homestead they all started with pencil and paper. It actually started years ago with a master footprint of my property laid out on a large piece of graph paper. Once the perimeter lines of the property were drawn I penciled in the house, patio, walkways and stationary structures like the barn and the greenhouse. I also included large shade trees, raised beds, arbors and flowerbeds. At that point I knew the areas I could plant fruit trees in. Needless to say, a small plot of land fills up fast, but it’s important to see where available space is in the greater picture rather than just digging a hole and planting a tree. STEP 2: DREAM! Dream Big. This is the time to go crazy. Make a list of all the fruit trees you’ve ever wanted, and especially the ones your family enjoys most. Don’t worry about whether or not the variety will work in your climate, just dream. STEP 3: Take your list and start researching. Check out growing zones for each tree. Some trees can’t handle hot dry weather while others shrink in humidity. You’ll also want to check the chill hours required to set fruit, especially for stone fruits, which need a certain number of hours below 45 degrees. This USDA plant hardiness chart will be helpful, while this chart at Grandpa’s Orchard gives a lot of good chill information. If you don’t see the variety of tree you want to plant just research it individually. No sense in going through the expense and work of planting an orchard only to have it fail. Master Gardener programs, local nurseries, Cooperative Extension and local gardeners are also good resources for specifics about growing fruit in your area. And, they have a vested interest in helping you get it right. Something else to consider…How much could your Orchard Produce? As an example, a mature citrus tree can produce 200 pounds or more, while a mature stone fruit tree, like peaches or plums, will give you about 75 to 100 pounds of fruit. If you have multiple trees…that’s a lot of fruit! So, unless you have a farm stand or family, friends or neighbors who you love to eat freshly picked fruit, you’ll need to think about preserving the harvest or limiting the number of trees in your orchard. Even a few trees can be a boon to your homestead production. STEP 4: Check out Tree Pollination. After you know what trees will do well in your area you’ll want to know which ones are self-pollinating and which ones need another tree in order to pollinate. Self-pollinating types include: apricots, pomegranates, citrus, figs, grapes, persimmons, most peaches, most berries, and European plums (although they produce better with two varieties). Trees that are not self-pollinators will need another tree for pollination in order to produce fruit. The trick here is you need to have two different varieties that bloom at the same time. If one tree blooms in spring and the other in summer they cannot pollinate each other. In a suburban setting you do have the opportunity to pollinate off a neighbors tree, as long as it isn’t much more than 50-feet away. Find out what variety they have and buy a different variety in order to cross pollinate. Trees that require pollination include: Apples, pears, Japanese plums, cherries and all nut trees. STEP 5: Space is always a consideration living on a small suburban homestead. But, that doesn’t mean an orchard cannot be in your future. With the surge in urban and suburban gardening and homesteading there is a plethora of fruit trees specifically for small areas. From dwarf to pole to espaliered trees you should be able to find what you’re looking for that will fit into your homestead plan. Remember also, that in a suburban setting you probably won’t have the traditional large orchard. Your fruit trees will probably be intermixed with flower beds, vegetable gardens, even planted close to a fence. Dwarf fruit trees are regular fruit trees hybridized to grow less than 10-15 feet tall, while standard fruit trees can grow as tall as 10-20 feet with a spread about the same. Espaliered fruit trees are specially pruned to grow flat against a wall or fence, which makes them perfect for small areas. Pole fruit trees are just like they sound. 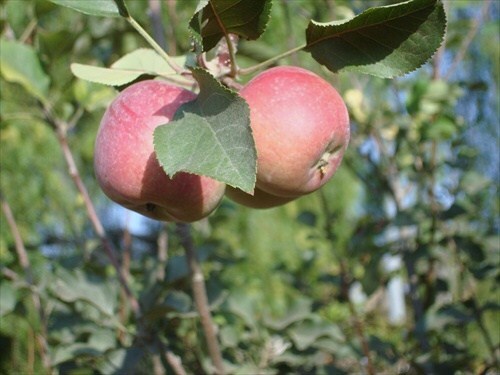 They are fruit trees that have been hybridized and pruned to grow vertically like a pole. They too take a bit more pruning to keep them manageable, but it is well worth the effort to have your own productive orchard. STEP 6: Walk your plan. Take your master plan and your list of fruit trees and walk your property. See where you have space and if the space is enough for a standard tree or if you’d be better off with a dwarf, pole or espaliered tree. Visualize how big the tree will be full grown and if it will over shadow other important areas of the homestead like the berry patch or veggie garden. No sense making a future problem for yourself. Also check water sources and proximity to neighbors. Once you plant your trees be sure to put them on your master plan and keep it safe for future reference. STEP 7: Planting. Don’t think you have to plant all your trees at once. An orchard is a long term project that will unfold over several years. Of course, if you just moved in and are setting things up this is a perfect time to plant and orchard and other long lived perennial plants like berries, artichokes and asparagus. Planting a few trees each year won’t take long at all before your homestead has a full grown productive orchard. Before you know it you’ll have juice dripping down your chin or sinking your teeth into a crunchy apple. Now that’s what I call Heaven! !